Magnetic reversals so aggressive researchers described them as "boggling the imagination." Steen's Mountain in Oregon, where magnetic reversals were found to have occurred in hours, not thousands of years. Further, when the center of the mid-ocean rifts were drilled downward, scientists found (the North/South reversals) reversals frozen down their length[ii] are captured in time once the magma cools, locking the compass switches in the rocks. (Authors note: one scientist (Humphreys) reported that of 200,000 such core samples taken, fully half or 100,000 show reversals around the earth). Clearly, much geologic activity was happening world-wide in the Flood period. Evolutionists attempt to assign these intervals with great ages, such as from 40,000-700,000 years for each change. This notion came under great scrutiny of late when samples from the Columbia flows in the scarp faces of Steen's Mountain in Oregon (where the exposure formation edges can be sampled), shocked the science world[iii] as to their rapid reversals, suggested by the researcher’s themselves could be measured in hours! "This period [of 15 days] is undoubtedly an overestimate …Nonetheless, even this conservative figure of 15 days corresponds to an astonishingly rapid rate of variation of the geomagnetic field direction of 3° per day[iv]." Dr. Russ Humphreys[v] predicted (preceding the discovery in Oregon), that if sometime in the future such a finding (that is, rapid reversals) would be significant support of his theories. With the Steen's find, we could then connect the rapid seafloor event to a rapid magnetic change sequences elsewhere. Humphrey's theory also included accurate estimates of the general depleting magnetism of the outer planets, and even out to galaxies, now supported by data retrieved by three NASA space probe missions! When the mass cools below the Curie temperature of 1000F[i], the polar direction becomes locked in position and can be measured. When sampled, the scientist carefully indexes the extracted core to determine its polarity relative to magnetic North. To determine the underwater parallel ridge compass directions, crews tow a sensor along the sea bottom and the sensing equipment collects the data. Dr. John Baumgartner continues on earth physics relative to geomagnetics: "From an estimate of the viscosity of the outer core, where the currents associated with the earth’s magnetism exist, there is no reason why the magnetic field can’t reverse rapidly. Moreover, there is field evidence that it has reversed rapidly, within weeks. In addition, drilling the seafloor has shown that, regardless of the overall direction of the magnetism detected from the surface, the magnetic direction within a drill core frequently varies widely. This is less consistent with slow spreading than with a rapid welling up of new magma during a period of rapid reversals; the magma in contact with the surface will reflect the direction at that time, but by the time the deeper magma cools a few weeks later, the direction has switched again—and so on for deeper levels." When correlating the three indicators; a) drilling the sea rift centers and finding back to back reversals, b) observing the same "flips" pushed out along the undersea parallel ridges and, c) the rapid reversals noted in the Steen's Mountain find, constitute powerful evidence all are related to a single event. 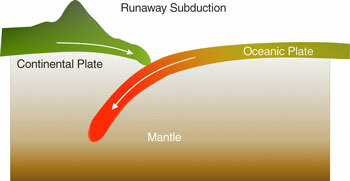 Further, that as the magma was pushing up and spread the seafloors, (the author believes that lunar cycles were involved, hence a pulsing action creating a line of magma apparent on the seafloor), the plate movements affected the magnetic reversals by unbalancing the "parasitic" magnetism interaction between the plates, subducting material and the earths core. Finally, the hard data from the Steen's provides correlating results from a time perspective, provide smoking gun evidence that the entire globe was involved in these processes. Does this revelation suggest that resistance to Dr's Barnes and Humphrey's work is quietly eroding? It appears so. Do these comments indicate that our magnetic field decline rate has lately accelerated? We don't presently know. If this comment is related to such, nothing can be done by man to stop it. The result would be that earth's protective shield would likely fall and we will be left unprotected from the Suns harmful radiation flares, flares that may come at any moment and completely disrupt life as know it on this planet. Weather now or later makes little difference; God has declared that a final judgment is coming on the earth since the Pillars of Seth on to the Bible. The warnings are there, and it's up to every individual to take the necessary action to save themselves from this last and final calamity, as clearly outlined in the Bible. Some forget that without this magnetic field, migrating populations of birds and fish would quickly fall into a state of confusion, disrupting the worlds environment for the worse.Clearly, as these species have complex receptors in order to use the fields in ways that are only recently becoming appearent, each were designed to work with the other, more evidence of creation! *Cited in: Folger, T., Journeys to the Center of the Earth: Our planet’s core powers a magnetic field that shields us from a hostile cosmos. But how does it really work? Discover, July/August 2014. Catastrophic Plate Tectonics or "CPT" is a new theory that explains the process of subduction, where once begun, could accelerate rapidly. (See image) In this model, gravity acts on the dropping or "plunging" crust material, (sea floor in this instance) pulling the entire mass downward, assisting the sea-floor "spreading" process. This model suggests global tectonic event powered by the gravitational pull of the sea floor(s) as they plunged into the earth’s mantle. The CPT model demonstrates that the plates moved quickly during the Flood catastrophe, not at rates of centimeters per year as currently proposed by uniformity, but at meters per second rates (one report suggests a rate of 80 meters/second). The CPT model more readily explains many of the earths features including mountain folding, these being pushed up (in accordion fashion) as a result of plate collision, and again, rapidly. [i] It’s a well known fact that the near vertical fault lines along the subduction planes are a major source of earthquake activity today, remnant of much more such activity in the past. In Oregon, accretion lines maybe viewed along Highways 20 and 22, suggestive of a very active process now frozen in stone, with little sign of movement today. Above them the Oregon "Coast Range" was formed, this by the action of subduction. In this treatise, we have very strong support in the earth sciences of rapid tectonic activity, fully aligned with the record of Scripture, which also contain a witnessed and documented account. Such an account may not be discounted as scientific evidence, silencing the argument stating the Bible is confined to the realm of religion alone.